A double dose of caramel--baked in with the fruit and drizzled on top--elevates the humble crisp to new levels of indulgence. Mix two types of apples for the best texture. The tender apples cook down and create a sort of thick sauce, while the firm apples hold their shape. Boiled cider, which you can purchase at specialty stores or online or make using the recipe on our site, adds an extra splash of apple flavor. For crumb topping: In a medium bowl, stir together the flour, oats, the brown sugar and the 1 teaspoon apple pie spice. Cut in the butter until mixture resembles coarse crumbs. Stir in pecans. Set topping aside. For filling: In a large bowl, stir together granulated sugar, the 1/4 cup flour and the 1 teaspoon apple pie spice. Add the apples. Gently toss until coated. Transfer apple mixture to a 9x9x2-inch (2-quart) square baking dish. Press fruit gently to make an even, slightly mounded surface. 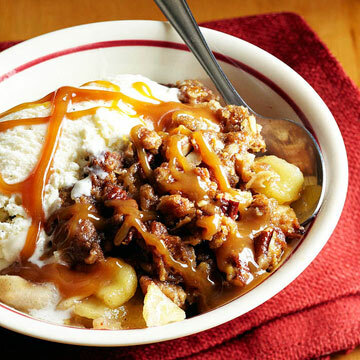 In a small bowl, whisk Boiled Cider into 2 tablespoons of the caramel sauce. (If caramel is too thick to measure, place it in a small microwave-safe bowl. Microwave, uncovered, on 100 percent power [high] about 20 seconds; stir.) Drizzle caramel mixture over apple filling. Sprinkle with crumb topping. Set the baking dish on a foil-lined baking sheet (to catch potential drips). Bake, uncovered, in a 375 degrees oven for 35 to 40 minutes or until topping is golden and apples are tender. Cool for 15 to 20 minutes on a wire rack. Just before serving, place the remaining caramel sauce in a small microwave-safe bowl. Microwave, uncovered, on 100 percent power [high] for 20 to 30 seconds. Drizzle caramel sauce over warm crisp. Serve with ice cream.